I strongly believe that LinkedIn Ads will be the best online advertising opportunity for the B2B industry. Because more than half of B2B buyers are looking to LinkedIn for the content that will help them be a better professional in their work. I am sure you have already considered several strategies for marketing your business. One of the best strategies is to use social media as leverage and market your business via one of these channels. So, in this article we will focus on LinkedIn, the social media platform that is sometimes overlooked by marketers and advertisers. Many people think that LinkedIn, being a business oriented platform, is suitable only for B2B marketing. At the same time, there are some who think that this channel may be superfluous even for B2B. Well, for a long time, LinkedIn was perceived as just a business network. You got to sign up, create your profile, add your coworkers and friends and endorse people for their skills. It was difficult for this platform to find its place in the social media environment of this decade but finally, it seems that it managed to do it. Most of today’s professionals are already here, the platform evolves constantly and businesses are already considering it as a major channel for recruiting personnel and for marketing and advertising as well. What changed during the past few years? After a series of updates and major changes, LinkedIn managed to attract a strong community, diverse in professions and social status of half a million users. According to their own stats, two new members are joining the platform every second and 40% of the total number of users is checking their accounts on a daily basis. And, it is not only about new members or the total audience. LinkedIn is also a social media platform where people hang out more often than they did it before. We know that there are 61 million high influencers on the channel and more than 40 million decision makers. These people are not just random individuals, they are professionals from all over the world, and some of them are highly skilled. Flexible budgets. There are no minimum and maximum costs when we advertise on LinkedIn. You can create your own budget and pay for as much advertising as you can. Tools for tracking and analytics. 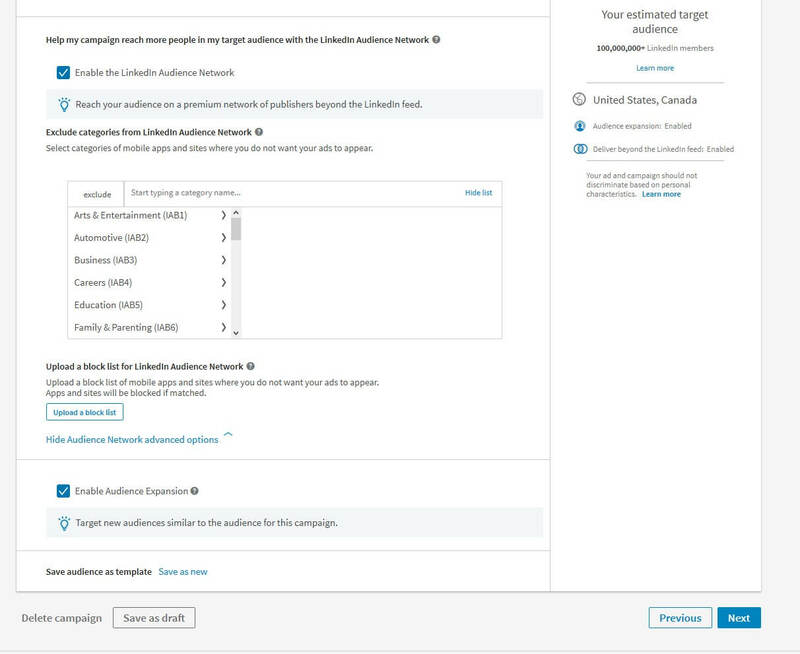 You can measure conversions from your LinkedIn ads, evaluate your ROI, see how many leads you get from your campaigns and optimize for better results. Advanced and effective targeting options. This is probably the most important feature for any advertising platform. You need to know to whom you are addressing and how to zero in your niche audience. 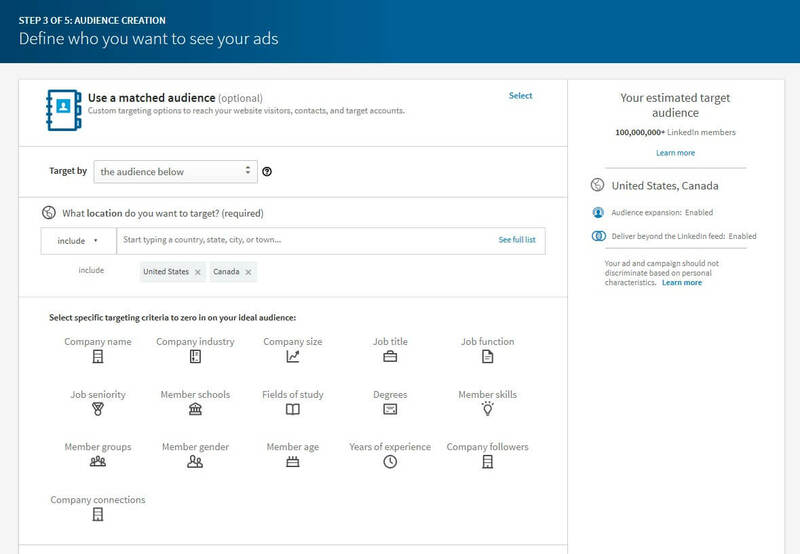 Moreover, you will be able to customize your targeting with matched audiences and engage in website retargeting or contact retargeting. A broad range of ad types such as: sponsored content, sponsored InMail, text ads, dynamic ads and programmatic display ads. First, you need to set your goals and your main objectives. Every new marketing campaign, whether it is content oriented, advertising oriented or both, needs to have clear starting and finish points. Nobody can assure you that these expectations will be met but in order to evaluate your entire effort, goals should be set up front. 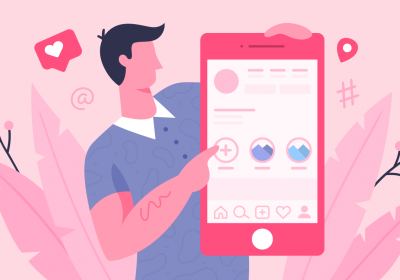 Considering that you’ve already decided to advertise on Instagram, here are the main steps you should undergo in order to do so. 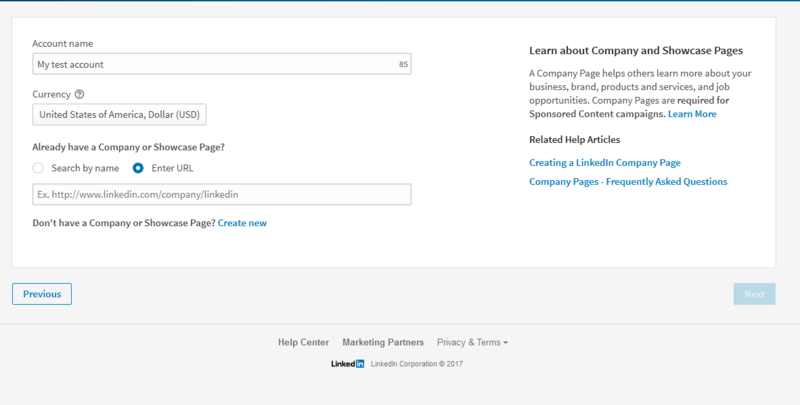 Go to https://business.linkedin.com/marketing-solutions/ads and click on the “Create ad” button in the top right corner of the page. 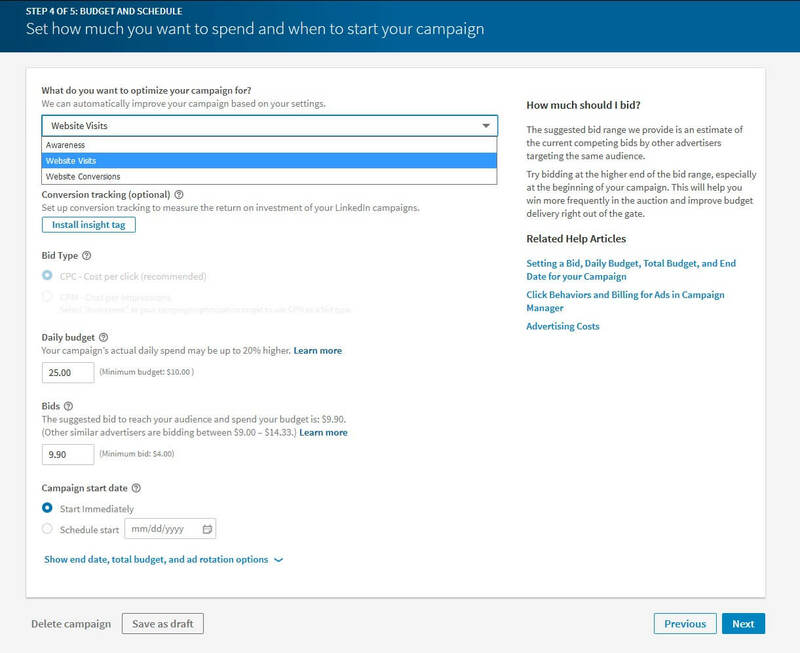 You will be taken straight to the Campaign Manager, from where you get to choose the type of ads you want to create. As you can see from the following image, there are three main options here: Sponsored Content, Text Ads and Sponsored InMail. The next step, is to set up you advertising account. 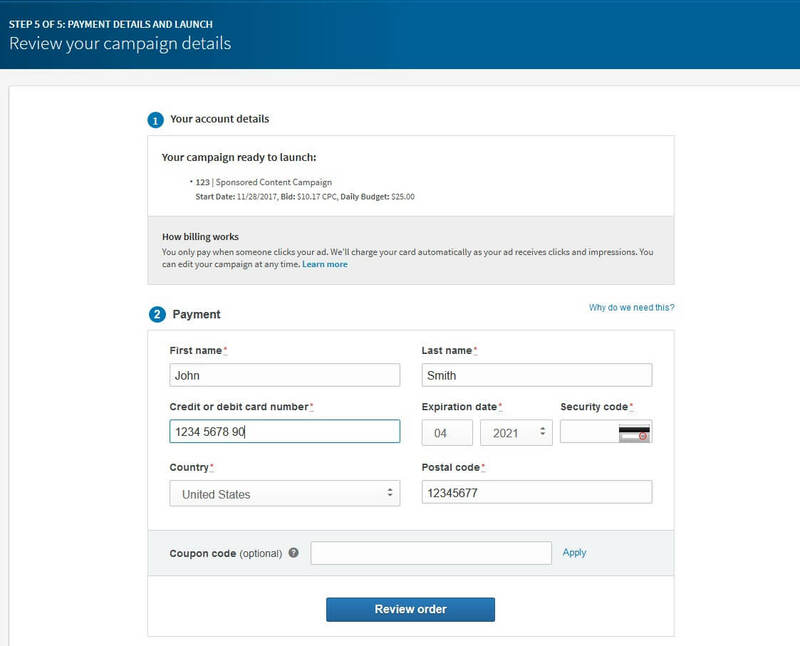 Fill in with your account name, the currency you are going to use for payments and the name of the company or the showcase page link. If your company is not set up with LinkedIn, you will have to do it before being able to proceed further. Click on the „Create new” link. You will land on another page, where you can register your company. 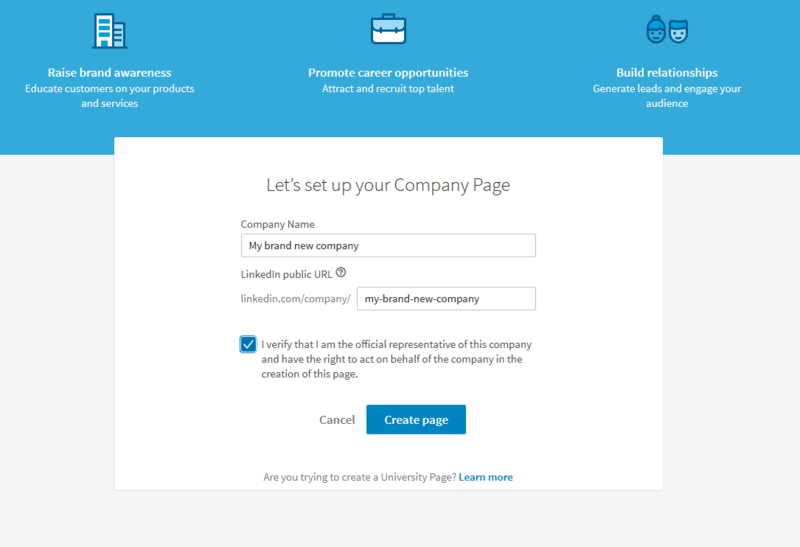 Once the company is listed on LinkedIn and your company page is completed, you can come back to the previous screen, search for your company name and click next. Of course, you can choose something entirely different for you campaign. Text ads for example, are not based on visual imagery like the previous selection but at the same time, they may lead you to better results, depending on your initial goals. I will highlight the differences in the following chapter but now, let’s come back to our main topic. The next panel takes us to the ad creator. Here, in case you’ve selected the sponsored content option, you get to upload your banner and insert your link. The recommended size of your LinkedIn banner is 1200 x 627 pixels for the best quality. You can create it with Bannersnack or, if you already have a photo suitable for the ad, resize it to meet the required standards. Of course, you can choose another LinkedIn post image size but if you want it to be displayed correctly, try to adjust your image to the recommended specs. The next step takes us to the targeting panel. This is the most important step of the advertising campaign as your success depends mainly on how good you manage to target your niche audience. Now, we get to the penult step, which takes us to the budgeting panel. Here, we get to select the goal (visits, awareness, conversions), the bid type and of course, our daily budget. This is also the place where we get to schedule the campaign to start immediately or later, at a specific date. The final step requires you to fill in with your payment information, the credit card holder’s name and the card number, security code and the country you reside in. Once all your billing information is set up, you can start your campaign and of course, start delivering ads to your targeted audience. Text ads or sponsored content? 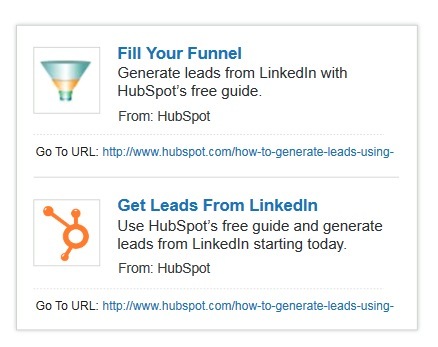 These two types of ads are the major choices you can make when you want to advertise on LinkedIn. Which one is better and for what purpose? Text ads and sponsored content are two entirely different types of advertising that ultimately, serve different purposes. The sponsored content ads look and feel similar to the sponsored posts on Facebook and all the newsfeed updates you receive on Facebook. On the other hand, text ads are similar to Google’s Adwords. According to Rebel Hack, after a series of tests on these two types of ads, there are some major differences when it comes to overall stats. For instance, the average CPM can rise up to 6 to 12 times higher on sponsored content than on text ads. You get however 10 times more impressions on text ads and a double conversion rate. What should you choose? Well, it depends, as I have already said it many times, on your goals and the type of campaign you are going to run. If you cannot decide on the type of ads to use, I suggest you to try to run a trial campaign for a month using text ads, which are cheaper than sponsored content ads. See how they convert and then move on with a solid basis. On the other hand, if your marketing campaign is based on content only, start with the sponsored content ads or the sponsored InMail ads, which are also a content-based type of ads. Another great advertising option on LinkedIn is through their Sponsored InMail feature. Unlike Sponsored Content, your ads will be delivered straight to your audience mail boxes and not on their feeds. Otherwise, the two ad options are quite similar, considering they are based mainly on content. What do you need for InMail advertising? First, you need a banner ad of 300×250 pixels, a call to action, a click-through URL and of course, your main content. Be advised that LinkedIn accepts texts no larger than 1500 characters and no more than 3 clickable links. You can access the full InMail ads specifications here. 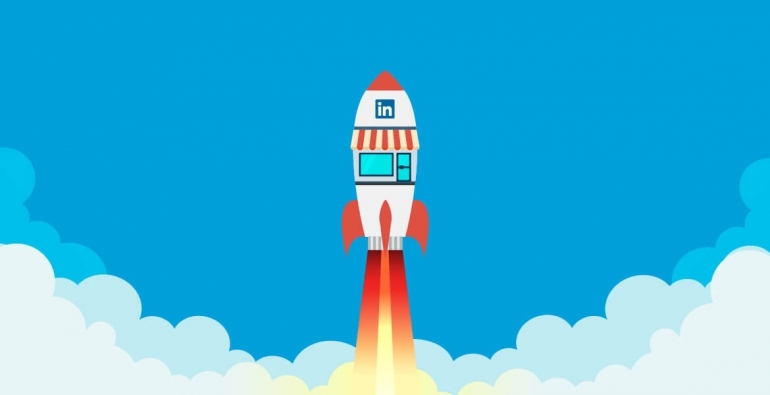 There are many ways in which you can create a successful campaign on a social media platform and LinkedIn gives you many opportunities for boosting your business. However, I think that everybody can learn better through the power of example. This is why, I will conclude this article by presenting a few success stories of advertisers that succeeded on LinkedIn. Adobe is a huge company and a popular name when it comes to digital design and photo manipulation software. However, do not think that they don’t have to face competition from other companies. However, their advertising company was not related to design but to digital marketing instead. Adobe’s products are well known among marketers and designers who are constantly producing quality content for their marketing campaigns. This time however, they aimed to further establish themselves as a leader in digital marketing as well. They found that 79% of their audience agree that Adobe can help them optimize their media spend. They are also 2.5 times more likely to agree that the content shared by the company captured their attention. What’s important is that 50% are more likely to agree that Adobe has a great role to play in the digital marketing industry, exactly what they intended to achieve through the advertising campaign. 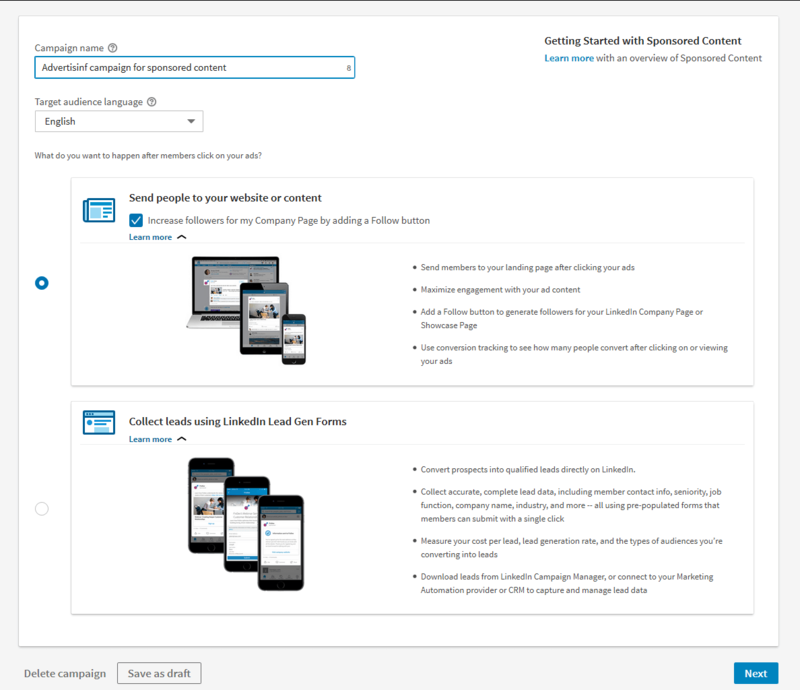 Another great method of working with content on an advertising campaign on LinkedIn is through their Sponsored InMail feature. CBRE, a commercial real estate services and investment company, a B2B service provider that until recently, relied only on traditional advertising channels. 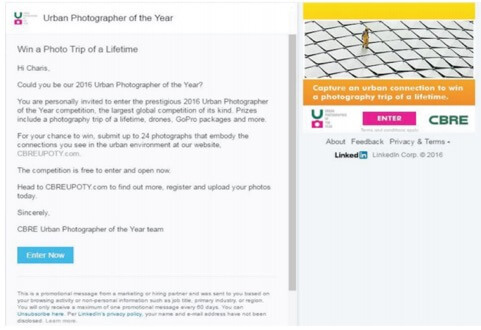 This time, they wanted to promote their annual Urban Photographer of the Year competition, which challenges photographers from all around the world to capture the essence of the city. “While the CBRE team had previously used digital marketing channels to promote the UPOTY program, they felt they could be doing more to reach and engage creative audiences, and sought to augment their strategy with a more targeted and measurable digital channel”, the official report said. The sponsored InMail campaign closed with a 54% open rate, 28% click-through rate and a staggering 41% increase in contest entries for that year. The company based in Cambridge, produces marketing software that helps businesses and webmasters increase their traffic, generate inbound leads, manage search engine optimization and more. They planned a text ads campaign on LinkedIn, hoping to reach out to a professional audience, increase the quality of the generated leads and encourage downloads. Their campaigns were highly targeted to suite specific different audiences. Also, they offered free educational materials to capture lead information. The campaign brought them high quality leads that were easier to convert and an average CPC of $3 which was lower than other channels for their targeted categories. Also, their click-through rates of 1% to 3% was calculated to be 60% higher than on other social networks. 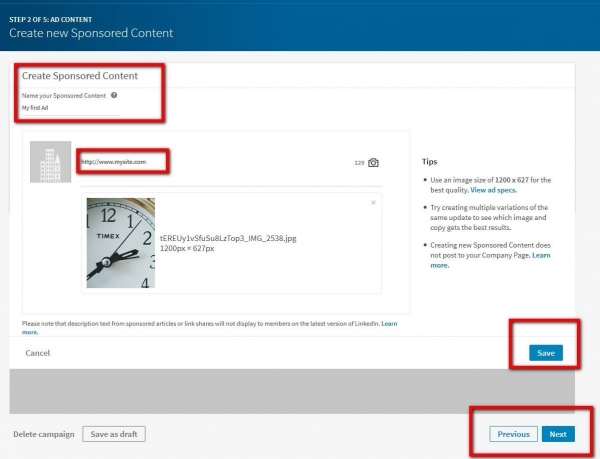 Another great example of a successful advertising campaign on LinkedIn comes from Aspect, a software company whose strategy was to advertise through Sponsored Content. “Sponsored Content helps us engage with different audiences in a grassroots way. It allows us to be more conversational, instead of just delivering a message in one direction,” says Kim Martin, director of corporate marketing for Aspect. Their goals were to drive traffic to their blog and to promote their content to key IT and customer experience decision makers from LinkedIn. The campaign was a huge success, with a 17% increase in followers for the Company’s LinkedIn page, a 290% increase in referral traffic to the company’s blogs and a 322% increase in LinkedIn engagement. LinkedIn is well known as a great social media platform for businesses and professionals. It’s a great network to showcase your skills and your experience if you are an individual. It is also a great platform for recruitment if you are running a business and you need to hire skilled professionals. What about marketing? 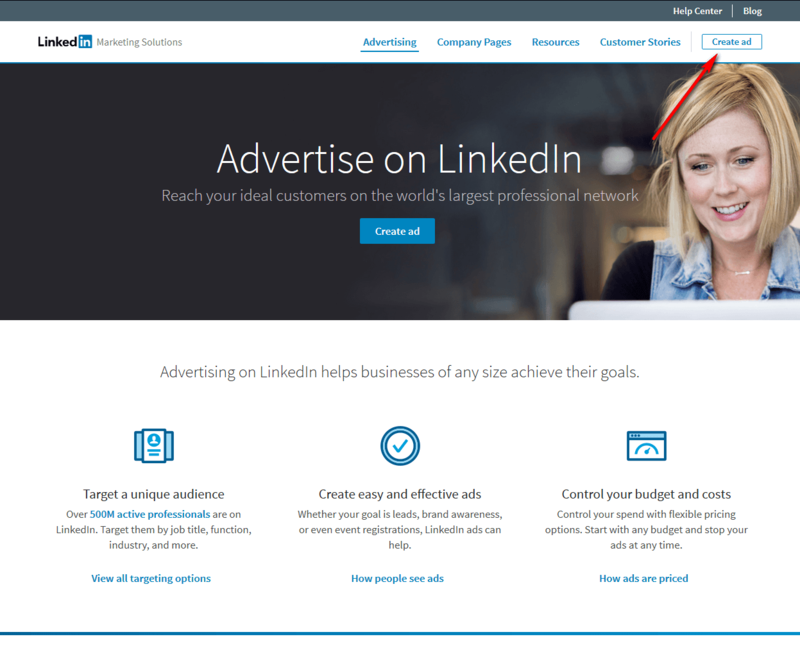 Is LinkedIn suitable for an advertising campaign? Well, I have tried to answer these two question throughout this article and talk about the different possible roads you can undertake when you advertise on LinkedIn. Also, we’ve learned together about some of the most successful similar campaigns that were ran on this social platform. What about you? 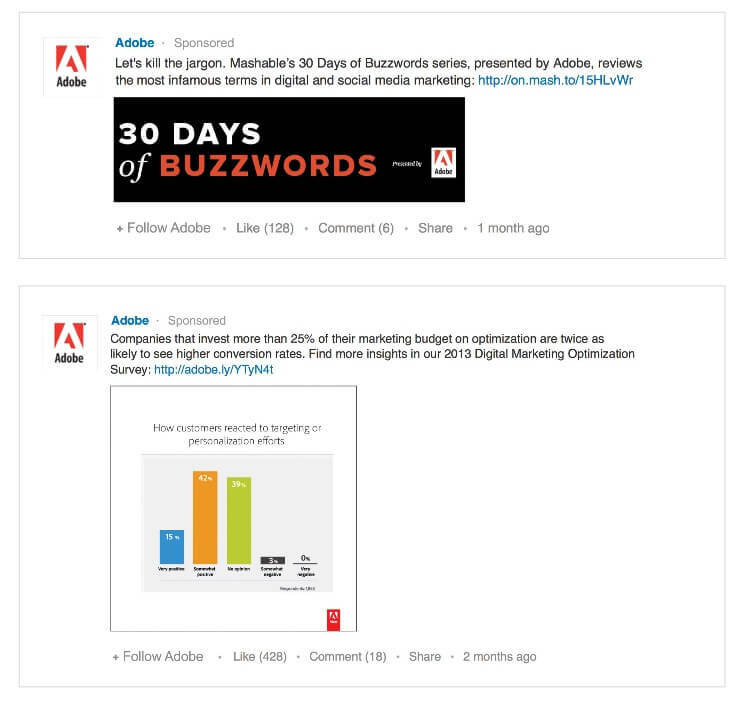 Do you intend to use LinkedIn as an advertising platform in the near future? For me, LinkedIn was just a business network like Xing. But good to know about the new features. I will try it out.